After what seems like months of endless rain, frosty air and unpleasant wind, the clouds have parted and temperatures are starting to rise. It’s beginning to feel like summer! 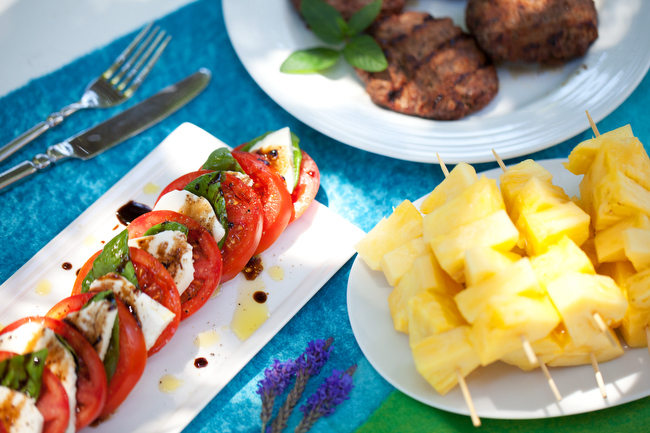 Chris and I celebrated with a lovely BBQ lunch in the backyard that included juicy organic grass-fed burgers, caprese salad and pineapple skewers. How come I wasn’t invited? 😉 Looks lovely and refreshing!